I used to drink much more coffee than tea, which ended in a very abrupt manner approximately 6 months ago. It has been a very harsh transition – I would rather give up chocolate and sweets of all kind than my coffee but I am dealing with it. It is the worst when DH makes a full pot of coffee on Saturday and Sunday mornings and the smell hits me. The feeling is very much like seeing an intense high school crush that you ache after, who does not even know that you exist. It hurts so. Part of my coping mechanism includes drinking copious amounts of tea, decaf tea (hark, the heavens are laughing at me…I, who used to take Louisiana Hot Sauce on my Cheerios during my pregnancies). If you had to venture into the dark side of sans-caffeine you too know that not every caffeine free tea is palatable but there are exceptions. One of my top choices is Rooibos tea. I used to drink this tea during my pregnancies and after but not this much. 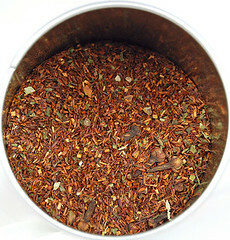 Rooibos is Afrikaans for ‘Red Bush’ and it is a member of the legume family of plants. It grows exclusively in the Cedarber Mountains and around Clanwilliam in South Africa (I had to look it up as I did not know where that was, oh the shame). To make the tea the leaves of the Rooibos bush are harvested, bruised, finely chopped, moistened and fermented in mounds. The resulting ‘leaves’ look nothing like the tea leaves that one would expect. 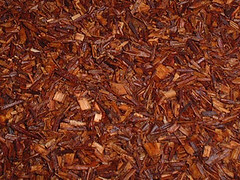 They are deep cinnamon bark red and look like the small candy pellets that one would sprinkle on cookies – you know the kind I mean – sort of like tubular beads. 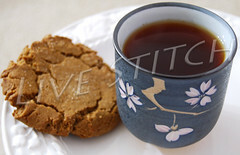 The tea brews a deep red and tastes very clean and very mild. For a tea that is not naturally caffeinated (it does not have to go through a process do become decaf), it is simply good. 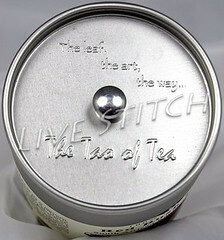 In addition, the more I drink the tea the more I like the taste so, it grows on one. For the lack of a better analogy, the tea tastes mildly like honey with a hint of milk or hazelnuts; it is hard to describe a taste this unique. 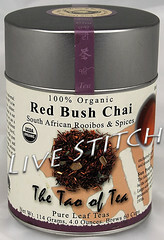 The Red Bush Chai adds cinnamon, spearmint, cloves and cardamom into the Rooibos leaves, which makes for a slightly spicy tea with a sweet aroma. You can see all that in this photo. I would almost call this a perfect tea for desert as it complements non-chocolate sweets very well. I don’t add any milk to my tea as I consider such an act scandalous but I know that my friends do and they think this enhances the taste of their Rooibos Chai very much. I add some sugar and drink it just like that. One final note about Rooibos, this tea contains Aspalathin, a flavonoid present in medicinal herbs used to treat skin and circulatory disorders. It is also known to contain traces of zinc, calcium, iron and manganese, which all help boost the immune system. In short, it is reputed to be good for you especially if you would like to drink something that is good for your immune system, helps your digestion and helps keep your skin healthy. You can read more about the specifics here. My tea pot is an old Bodum all glass, which allows me to see the change in the color of my tea while brewing and know when it is ready. This probably makes me qualify as an A type personality but I feel every tea must have the perfect cup and therefore, this cup makes me happy. 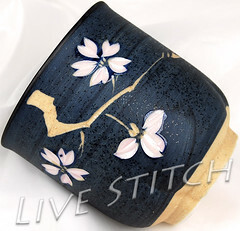 It has a granite-like shell with cherry blossoms etched deeply into it. 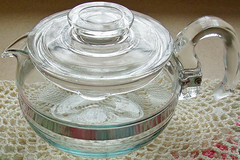 It also has a thin lip, which is great for drinking tea. Of course, one must not forget the fact that the water has to be boiled to brew the tea, for that I use this 60’s (or is its 70’s), pyrex pot I got from a church fair. PS. Are you counting with me? Post #3. Thank you so much for your recommendations for a charity, one that I could donate the sample kids’ garments we had. I ended up filling two boxes that weighed approximately 40 pounds, all brand new clothing items for kids and a few for grown ups. I went with The Baby Boutique; it seemed like the best fit. This lovely charity provides goods for homeless kids and I could not be touched more. They were very responsive and returned my call within 30 minutes and the thought of a sweet little thing wearing something that I can provide made my heart warm. For the remainder of the year I will be in search of new and gently used kid’s garments. I also plan to knit as many hats, scarves, and cardigans as I can. I hope to have another couple of boxes for the Baby Boutique later this year. What they do touches my heart. Now on to that one good woman. One of my beautiful customers, Suzanne, emailed me unexpectedly and asked if I would like a free pattern for a yarn of ours, Little Knits Indie II, a scrumptious cashmere silk blend (sorry cannot help myself – I love this yarn). She wanted absolutely nothing for her pattern! 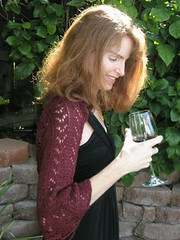 And, she agreed with my proposal when I asked her for the pattern and a charity of her choice. Let me explain – all proceeds from Suzanne’s pattern Erika will go to Knitters Without Borders to benefit Doctor’s Without Borders. In addition, I/Little Knits will match the purchase price 100% and donate that amount to the same charity. We will keep a monthly tally posted on the website and donate every month. I think this would be great don’t you? Thank you Suzanne! If you have a pattern that uses one of our yarns and would like to share it in a similar fashion for a charity of your choice please let me know with an email. 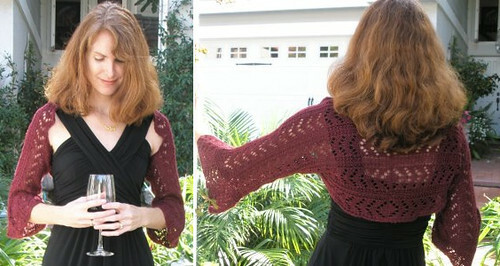 I would be more than happy to list your pattern on our website and match the purchase price as I did for Suzanne’s pattern. I have over 50 model garments (sweaters and cardigans), that would fit 2-3 year old kids, both boys and girls. They are very cute, brand new and still in their sealed bags (we never used them at the store or otherwise). This may not be very timely with the weather slowly warming up but I would like to donate them to a charity that can actually put them to good use. I would appreciate your help with suggestions on charities that would be able to use these garments. Please let me know if you have any ideas and/or contact info. These items are rather nice and I would like to think that they would actually be used by little girls and boys. Many thanks – in advance – for your feedback.